FLOWERS – The flowers on the Communion table this morning were provided by Karol Hoyt. Chamber Singers Choral Ensemble – is meeting on Thursday nights from 7:00 – 8:30pm to prepare for Easter. We have some great music, and we'd love for any singers to join us! EASTER LILIES – If you are interested in sharing a lily with the congregation Easter morning, in memory of a loved one, please bring it to the office by the Wednesday before Easter. We will put your name and your loved one’s name in the bulletin. You may also bring a lily to share with us Easter morning. CELIA WHIDEN’S MEMORIAL – Will be held Saturday, April 14 at 1:00 pm with a reception following. NEXT WEEK is the Easter Sunday and Pastor Merrie continues the Series on Mark with the Message “Fear and Amazement” from Mark 16:1-8. 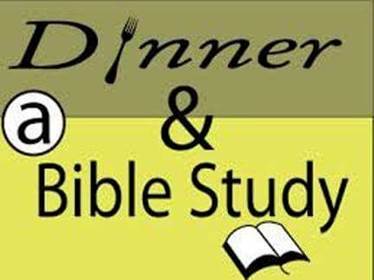 Dinner and a Study is Back Tonight!